I typically wouldn’t discuss Tax Reform until it has passed since it would usually be speculative, I am making an exception given that many of the parameters are known and because of its potential impact on housing. The basis of the plan was to cut the corporate tax rate first and then work around the constraints that Senate rules and supposed deficit hawks impose on the process. As a result, there are some unintended consequences, particularly when it comes to housing. It’s also taken some of the power away from lobbyists since it appears that the Republicans will do anything to pass something even if it’s unpopular. They cannot fathom going into the 2018 elections without having done something of significance that was part of their agenda and platform. Prior to any new tax legislation being passed, the housing market nationwide has seen a dramatic reduction in the number of homes for sale since the bubble/boom of 2005-7. 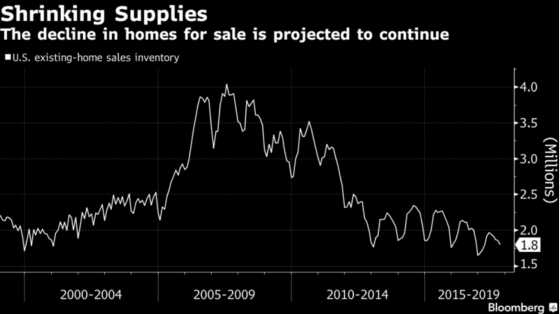 As the following chart shows from Bloomberg, there has been a big drop in homes available for sale over the last seven years. Homebuilders are challenged to produce enough new housing to meet the demand due to labor shortages, more cumbersome entitlement processes, access to quality land sites, and higher land and material costs. The lack of supply has also made sellers reluctant to list their homes for fear of not finding another home to buy that meets their needs. One of the features of the contemplated legislation is changing the length of time one must own a home to shelter up to $250,000 of gain for individuals and $500,000 for married couples. The current law requires that one must live in their primary residence for two out of the last five years to qualify for the tax exclusion. The proposal now on the table is to increase that to five out of the last eight years. This will now create an incentive for people to stay in their homes longer than they otherwise might have, thereby holding more inventory off the market. This is especially relevant now as five years or more of price appreciation has resulted in millions of homeowners now having equity in their homes who would be subject to being taxed on their gains if they don’t meet the new rules. This should serve to create an even greater squeeze for prospective buyers and push home prices higher in high demand markets. 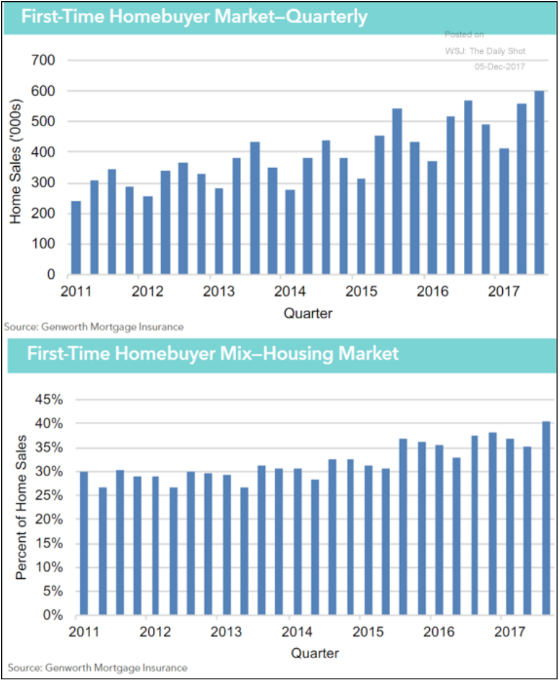 As the following charts show, first-time home buyers are becoming more prevalent in the market. While this is having some impact on apartments as a lot of new units are hitting the market and any reduction in demand creates more pricing pressure on landlords, from a single-family perspective, however, there is still not enough housing being built. With this being said, the challenge for apartment owners at this moment in time is more apartment supply than competition from single-family homeownership. Our turnover rates have not increased that much, and although home buying is a more prevalent reason for moving out, the challenge stems more from apartment developers offering move-in incentives to lease up their properties. It’s important to understand what incentives are created and how this may affect behavior at the margin. 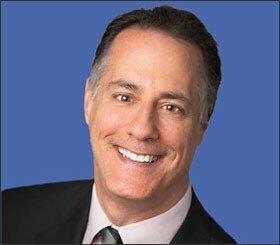 High tax states with high housing costs (e.g. California, New York, Connecticut, and Hawaii) will be less appealing to higher wage individuals and homeowners. This is because right now the proposal calls for a deduction for property taxes being limited to $10,000 per year with no deduction for state income taxes. There is talk of allowing people to take up to $10,000 for both, but time will tell if this is implemented. With high average housing prices and high taxes, a state like California does not fare well and creates an incentive for people to move to states with low or no income taxes and relatively affordable housing. Texas, Florida, and Arizona are seemingly well positioned. 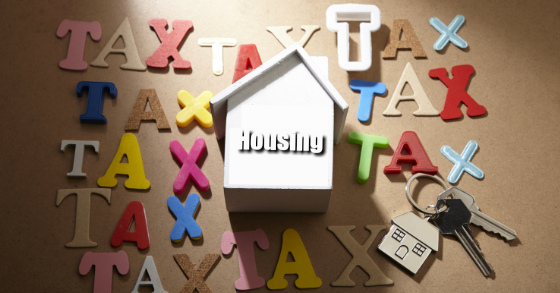 One potential unintended consequence may be the creation of a new supply of rental housing from second homeowners who may no longer be able to write off their property taxes and interest expense. If they convert their properties to rental real estate, then they can collect rental income and deduct these expenses. That can be a big financial change for second homeowners. Although a state like Texas has high property tax rates, home prices are such that most homeowners should be able to write off their property taxes and mortgage interest (limited to either $500,000 or $1 million depending on the plan). At the margin, one would expect population growth to be higher than it otherwise would be for states like Florida, Texas, and Arizona as people may be more apt to relocate there from higher cost states that are harmed by the tax law changes. Goldman Sachs upgraded Camden Property Trust based on its exposure to low tax states. Given CWS’ large exposure to Texas we are hoping Goldman Sachs’ intuition is correct should the tax laws change. It would also seem to give a little more impetus to renting given some of the benefits of homeownership being taken away by the changes. One beneficiary of the proposed changes is commercial real estate as it comes out well in the plan. The 1031 exchange is preserved while eliminated for other assets such as art. Equally important, Interest is still deductible, there is a more generous depreciation schedule, and the tax rate for partnerships and LLCs, the dominant form of real estate ownership, is quite a bit lower than the highest marginal tax rates. It’s rather surprising that this would be the case with a real estate developer as president but we will take what we’re given! Time will tell what the final legislation looks like if it gets passed but those are my current thoughts so far.